The two islands, Cumberland Island and Little Cumberland Island are split by a narrow winding salt water pass called Christmas Creek that runs from the ocean through the marshlands on the inland side of the island. Cumberland Island is owned by the State and Little Cumberland is privately owned. The lighthouse sits at the very northern tip of Little Cumberland Island and looks over towards Jekyll Island. It’s the last lighthouse on our trip and the most southern lighthouse in Georgia. Originally called the St. Andrews lighthouse as it faces St. Andrews sound, the name was changed after the Civil War. The lighthouse stands only sixty feet high and has been out of service since 1915. Hidden behind a large sand dune, only the top part of the lighthouse can be seen from the shore. If the dunes roll over any more from the blowing sands, the lighthouse will disappear in the dune itself. When I was there the towering dune was almost touching the door of the lighthouse waiting to engulf it. It’s not an easy lighthouse to get to. First of all, the entire Little Cumberland Island is private property and from my experience, just about impossible to get permission to walk up to the light. It isn’t far from the shore however, and anyone is free to stroll the beach up to the high water line and that will put you within a couple hundred feet of the light. You have to be a fervent lighthouse enthusiast to want to visit the Little Cumberland Island lighhouse. The only way to get there is to charter a boat although you can see the lighthouse from the southern end of Jekyll Island. A marina just to the right as you enter over the bridge to Jekyll Island has several private boat charters available. We hired a captain and boat and after visiting the lighthouse took a delightful tour to the northern end of Cumberland Island. There we visited an abandoned mansion called the “Plum Orchard”, once owned by Carnegie and built for one of their children. We enjoyed the marshlands along the way, and viewed the wild horses, turkeys, and nesting ospreys along the way. It’s a delightful way to spend a few hours and will make a charter trip to the Little Cumberland Island lighthouse worthwhile. If you have your own boat there is a public boat ramp just a little south of the marina but the pass between Jekyll and Little Cumberland is very rough most of the time so use caution. The lighthouse at Little Cumberland Island is the southernmost lighthouse in Georgia but it wasn’t always so. Another lighthouse was placed on the southern end of Cumberland Island in 1820 and was in service for eighteen years. It still exists but not where it was originally built. You’ll have to drive down to Amelia Island, just across the border in Florida to see it. The entire brick lighthouse was dismantled and moved there. Cement was not as tough as it is today and the mortar between the bricks was easier to chip apart but I still can’t imagine disassembling a tower some seventy feet high with five foot thick walls and moving it piece by piece but that’s what they did. It is the northern most lighthouse in Florida and still operates today. If you have the time a visit to Cumberland Island is a wonderful place to spend the day. It’s an entirely different trip than in getting to Little Cumberland Island. To get there visitors have to take a forty-five minute ferry ride from St. Marys. Once there, you can see wild horses as they freely roam the unspoiled forests along with deer, wild hogs, and turkey. Huge century old oak trees line the dirt road that leads to the sixty room mansion called Dungeness, once owned by Thomas and Lucy Carnegie. It was constructed mainly of tabby like the slave houses at Sapelo Island and made in the same way by burning oyster shells over a grate which turned the shells into a powder to produce lime. When mixed with equal parts of sand, water, and broken oyster shells to give the substance extra body, it made a hard a durable mixture and was the equivalent to cement. It was used extensively in building many homes during that time. The mansion now stands in ruin after an arsonist burned it down in 1957 leaving only the tabby walls and stone work as a reminder of what a magnificent house it once was. A complex next door to the mansion was also a splendid affair. Made of wood instead of tabby, it was once the place where guests could enjoy indoor swimming, a squash court, billiards, get their hair done with a private beautician or take advantage of the full time doctor. The recreation complex also doubled as a bachelor complex for those unmarried men who stayed at Dungeness for several weeks. It never burnt down like the mansion but lies in ruin nevertheless, having totally collapsed from years of neglect. Even these remnants gave me a sense of awe and wonderment at what a truly grand place this must have been for its visitors and owners of the time. To know that this entire self-sufficient community was built on a remote island so many years ago is even more incredible. Starting in 1880 and lasting forty years, three hundred servants and caretakers made this paradise a reality raising their own vegetables and livestock, tending the fruit trees and flower gardens, maintaining the carriage house, machine shop, carpentry shop and commissary. The large carriage house and some of the smaller buildings still remain such as the facility that did nothing but laundry for the many guests and the ice house where huge blocks of ice were brought down by rail from the north and then delivered to the island by boat. There the ice was stored and used throughout the summer. The task of creating this luxurious environment must have been a monumental undertaking especially considering its remoteness. Other mansions survive on the island, some privately owned and others like the “Plum Orchard”, remain intact but empty and in need of repair. It all came to an end in the 1920’s when the owners either passed on or found other interests. The park service has left most of the structures to take their natural course of decay and as a result they are beyond any type of repair or restoration. A few of the buildings have been maintained and restored. It is a wonderful mix of history that can only lead visitors to marvel at how life must have been back in that age when this was once a self sufficient community built to serve a handful of remarkably rich owners.Park rangers guide visitors on a walking tour of the island that lasts about an hour or so. Visitors are also free to explore on their own or trek over the dunes to spend time on the long expanse of beach. Camping is also available on the island. Only three hundred people are allowed on this twelve by four mile island daily so it’s never crowded and makes the experience even more unique. If you would like to see the lighthouse on Little Cumberland Island (not to be confused with Cumberland Island), I suggest that you go to Jekyll Island. That’s the closes place to Little Cumberland Island. Little Cumberland us just to the south of Jekyll Island. You can actually see the Cumberland Island lighthouse from the southern end of Jekyll. On your way over to Jekyll Island, there is a marina just after you cross the bridge entering Jekyll Island on the right. There are several small boats there that you can charter with a captain to take you over to Little Cumberland. I suggest you call Larry Crews at 912-265-7529. Larry runs a fine boat, is knowledgeable, patient, and take you near the lighthouse (once again, you can’t actually walk to it since it’s on private property, but you can get close). He can also take you around other parts of the island where you can get up close to osprey in their nests, wild horses, and dolphins out in the pass between Jekyll Island and Cumberland Island. If you have time he can take you through the marshlands to Cumberland Island where you can visit and walk around the once incredible “Plum Orchard” house. During the winter months Larry can take you offshore to see the Right Whales and If you like to fish, Larry Crews is the man you want to contact. He’ll take you out on a fishing trip and from what I have heard, you won’t be disappointed. On 25 May 1808, John and Charles Floyd purchased Little Cumberland Island from the heirs of General Nathaniel Greene for the sum of $1000.00 (Camden’s Challenge – A History of Camden County, GA, by Marguerite Reddick, pub. by Camden Printing Co., 1974 — there are subsequent publishings). 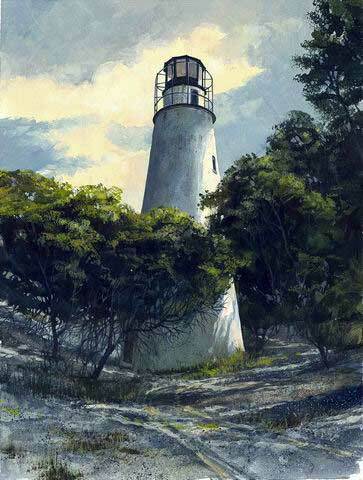 On 24 August 1837, John Floyd sold six acres on the north end of Little Cumberland Island to the United States Government for a lighthouse to be erected on St. Andrews Sound (Camden Co. Georgia Deed Bk. N 1837-1844, pgs. 32 & 33): “John Floyd … hath granted, bargained, sold… unto the United States of America Six acres of Land on the Island of Little Cumberland and at the north part of the same and selected as a site for the contemplated Light House to Saint Andrews inlet as the Plat thereof…”. Floyd received $500.00 from the transaction. In August 1989, the lighthouse was placed on the National Historic Register.